Roy Lichtenstein, one of the most familiar names in American pop art, using a style borrowing from comic strips to create works that portrayed the culture of contemporary life. 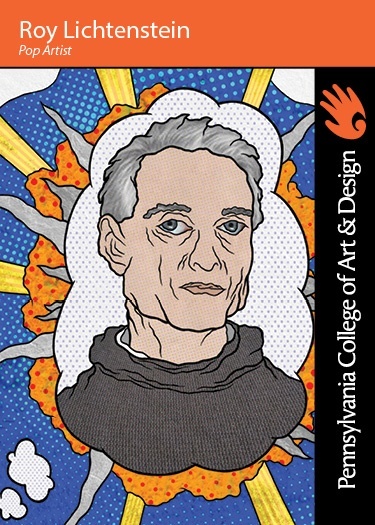 Using bright, vibrant colors and printing techniques he translated themes about consumerism through references to famous and historical works of art. A native New Yorker, he became interested in art and jazz while attending New York’s Franklin School for Boys and taking classes at Art Students League, where he studied with American realist painter Reginald Marsh. His college education at The Ohio State University was interrupted for three years by World War II. He returned to study at OSU, under Hoyt L Sherman, and in 1949, he received a Masters of Fine Arts degree. Through the early 1960s, he adopted the style of Abstract Expressionism while teaching at the State University of New York at Oswego and furthered his interest in making pop paintings while teaching at Rutgers University, New Jersey. During this time, he had his first solo exhibition at the Carlebach Gallery in New York. An exhibit at Castelli Gallery, his entire collection was sold before the exhibition opened. Of his works produced during this time, “Drowning Girl,” is now housed at the Museum of Modern Art, New York, and “Whaam!” is now at Tate Modern, London. These works are examples of the way he adapted of comic-book characters and storylines into his paintings. During the 1060s, Lichtenstein began his “Modern Painting” series and began using his distinctive Ban-Day dots and geometric shapes and lines, making more than 60 paintings in this style. 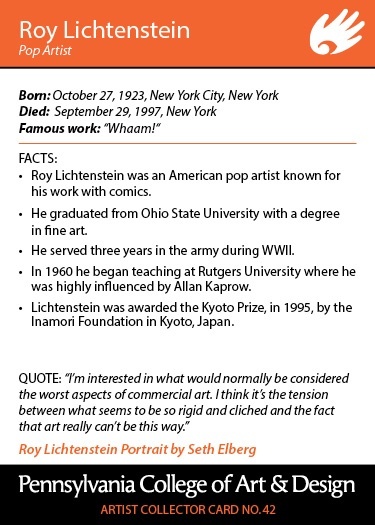 Lichtenstein's work is in the permanent collection of the National Gallery of Art in Washington, D.C., the Art Institute of Chicago and many other permanent collections.